Large, simple blooms float above finely cut foliage, in well-balanced contrast, from late spring to summer. Where grown as a perennial, the asiaticus species needs a dry, dormant period after flowering ceases. Wonderful for mixed borders and rock gardens. Makes a breathtaking potted specimen plant. 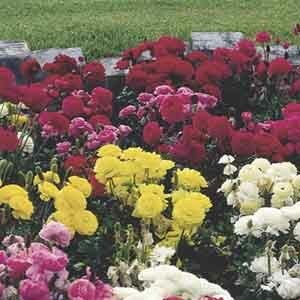 Provides long lasting cut flowers. Best planted in groups. Grow in fertile, humus-rich, well-drained soil. Allow soil to dry between thorough waterings. Remove faded flowers for best display.